The first processions of Holy Week are already in the streets. The faithful are fretfully checking the weather forecasts for the coming week, hoping and praying that their favorite pasos, images of Christ crucified and the grieving Virgin Mary, will not be prevented by rain from leaving their sanctuaries. 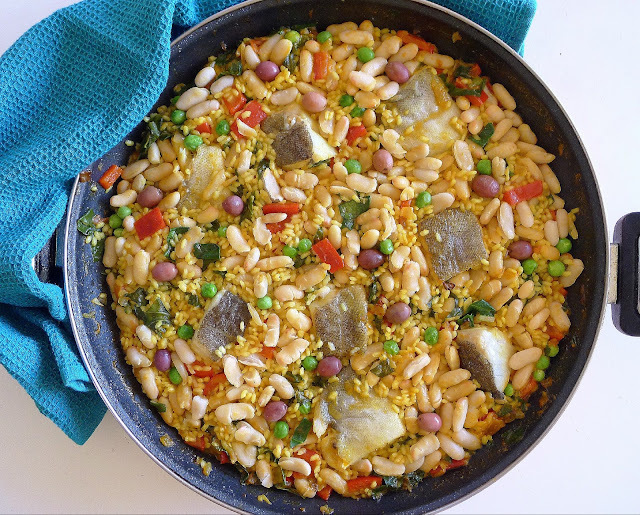 So, people, it’s time to put your bacalao to soak if you want to serve it for Viernes Santo, Good Friday (this year on March 30). Bacalao—dry salt cod—is the traditional food during Lent, the weeks preceding Easter, and, especially for Holy Week when the religiously observant abstain from eating meat. 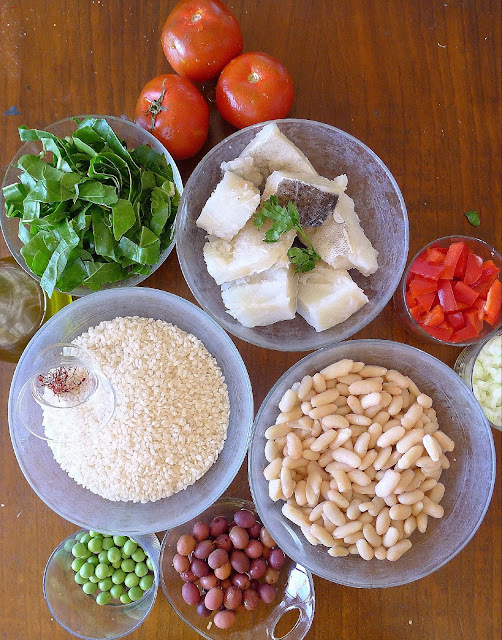 Of course, all fish and shellfish as well as legumes and dairy foods make up Lenten meals. But in olden days, before refrigeration made fresh fish available inland from ports, long-keeping salt cod was about the only fish available. For that reason, it continues to be the favored food for the season. Chunks of bacalao cook with saffron rice. White beans, peas and olives make a "cobblestone" effect. 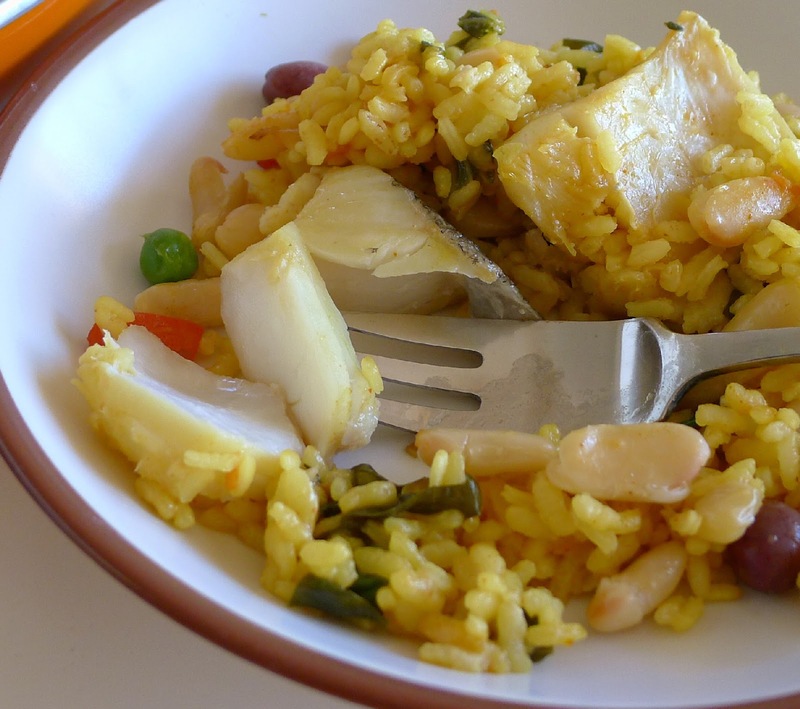 Once fairly inexpensive, bacalao (from Scandanavia—there is no cod in Spanish waters) is pricey. I paid €9.00 for a piece of about 500 grams ($11.00 for one pound). And that was not bone-free fish! If you buy boneless lomo, the center “loin” of cod, you will need less than if you are cutting a piece from a whole or split that has fins and spines. Bacalao needs to be soaked in several changes of water to rehydrate the flesh and remove the salt, usually 36 to 48 hours. Thicker pieces may need longer soaking; thin pieces and scraps need less. 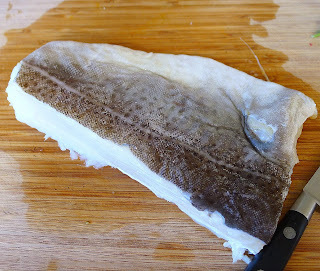 (It’s ok to taste uncooked cod to decide if it’s sufficiently de-salted.) If cod is de-salted sufficiently before you are ready to cook it, drain it, wrap in plastic wrap and refrigerate. 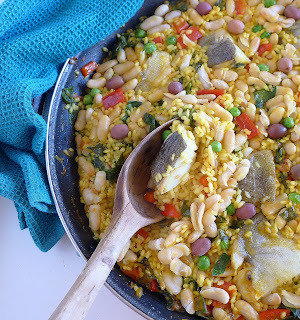 The rice is paved with"cobblestones" of white beans, green peas and purple cuquillo olives. 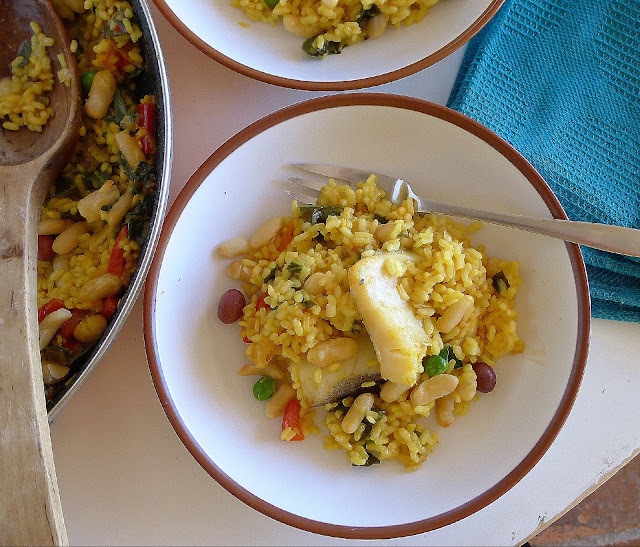 Like paella, rice with cod and vegetables is cooked "dry," not soupy. Rice with salt cod is typical for Lenten meals, but is a delicious dish any time of the year. After soaking and gentle cooking, dry salt cod is moist and flaky. Wash the cod under running water. Place it in a glass bowl and cover with fresh water. Cover and soak the cod, refrigerated, for 36 to 48 hours, changing the water every eight hours. 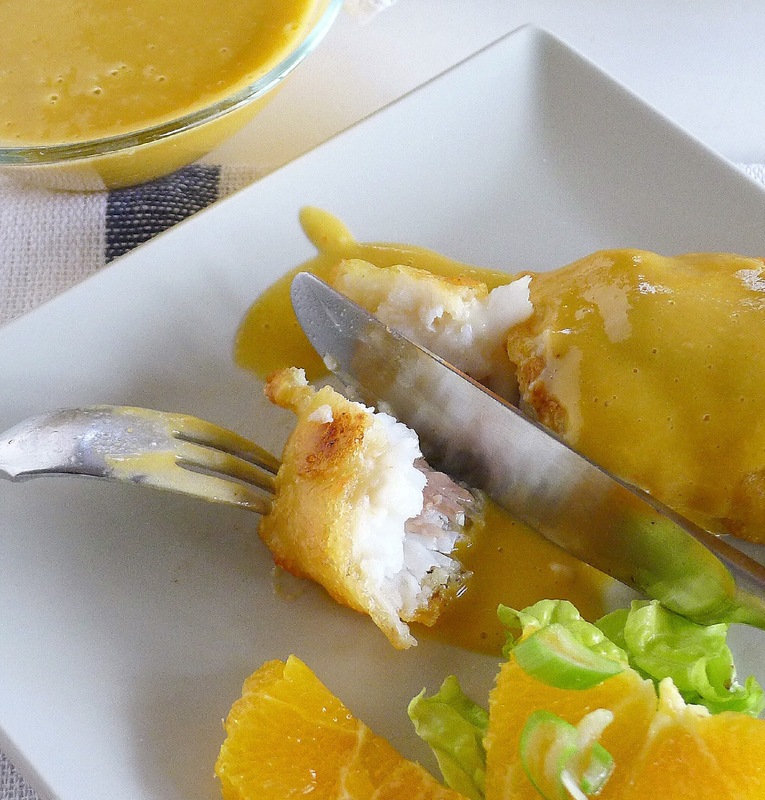 Each time you change the water, rinse the cod and squeeze it gently before adding fresh water. This piece of cod has been soaked 48 hours. 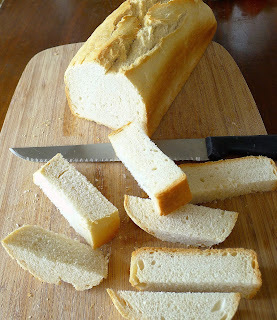 Use a boning knife to cut away any bones or dark membrane—but don’t remove the skin. The skin will keep the pieces of cod from disintegrating while cooking and gelatin in the skin gives consistency to the finished dish. You can use the bones and trimmings to make a very simple stock in which to cook the rice. Cover them with 6 cups of water. Add parsley, sliced onion, a strip of lemon peel and bay leaf. Bring to a boil and simmer 30 minutes. Strain the stock and reserve 4 cups of it for the rice. Use cooked or canned white beans, well drained. This recipe has chard, but other vegetables such as cauliflower, artichokes or green beans can be used instead. I’ve added green peas and purple-black Valencia cuquillo olives for some cobblestone color! This rice dish is cooked “dry,” like paella. If you prefer, use more stock or water and make it meloso, somewhat the consistency of risotto. 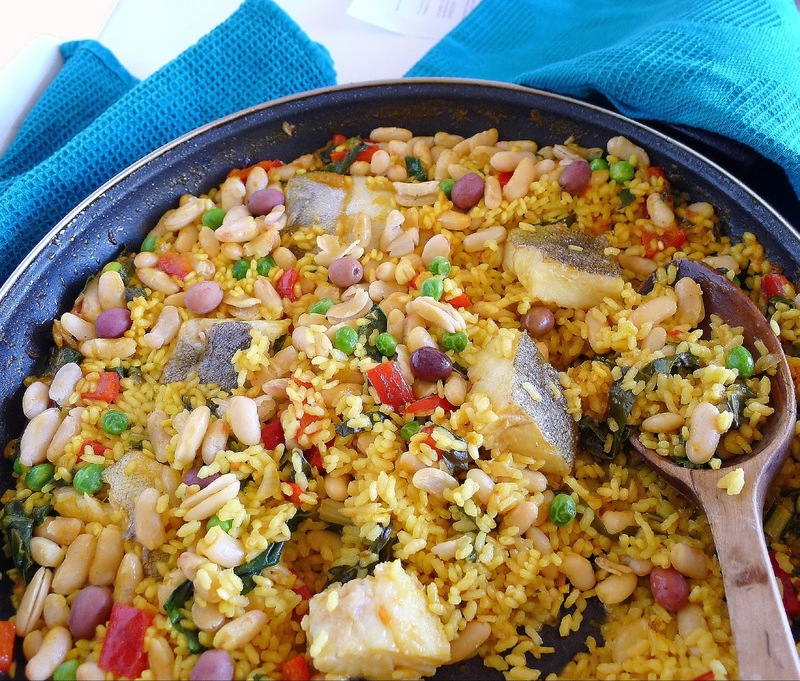 However, don’t stir the rice after the bacalao and beans have been added. Fresh chard leaves, de-salted cod, tomatoes, onions, cooked white beans, cuquillo olives, green peas, medium-round-grained rice and saffron are the ingredients for this rice dish that is cooked like paella. Cut the cod into 6 to 8 chunks. Pat them dry. Heat the oil in a paella pan, large skillet or flat-bottomed wok. Place the pieces of cod skin side down in the oil and fry them about 1 minute, without turning. Remove and set aside. Add the onion, garlic and red bell pepper to the pan. Sauté on medium heat for 3 minutes. Don’t allow the onions to brown. Add the chard and the tomatoes. Sauté for 3 minutes more. Stir in the rice. Add the pimentón. Add the fish stock or water. Add the saffron. Bring the liquid to a boil. Cook the rice on medium-high heat for 5 minutes. Scatter olives on top of the rice. Remove from heat, cover with a dampened cloth and allow the rice to set in the pan 5 minutes before serving. Salt Cod with Cauliflower and Garlic Sauce. Salt Cod in Garlic PilPil Sauce. Chickpeas, Spinach and Cod Dumplings. 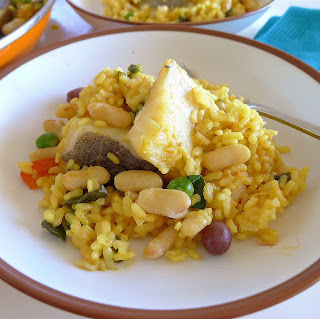 Salt Cod Arriero with Pine Nuts. Sometimes, when I know I’m going to be the only one for dinner, I buy a very small portion of an expensive ingredient. Today. the local butcher had a tray of veal cubes. 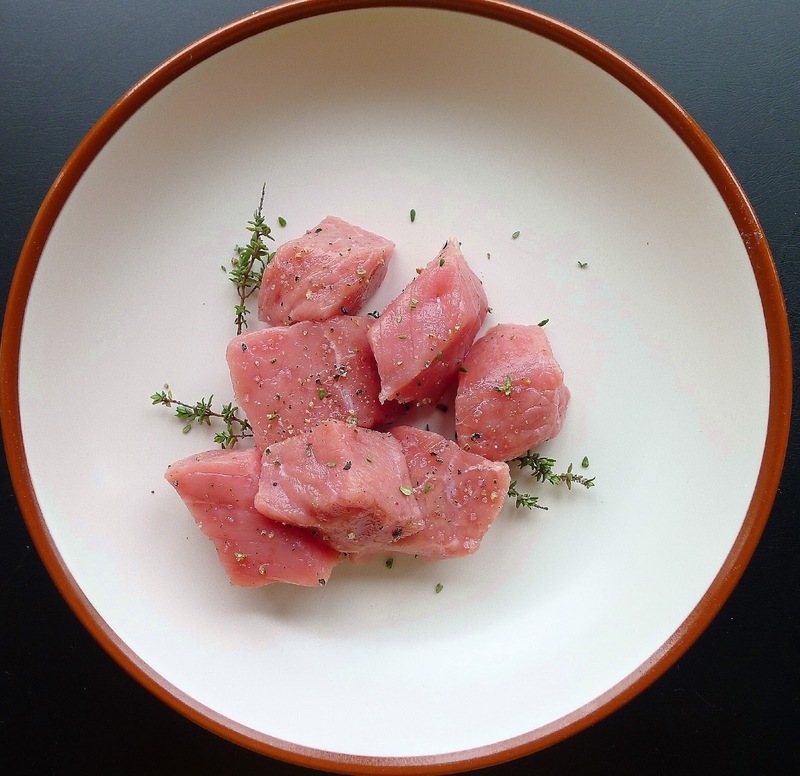 Real veal, a rosy-pink-fleshed meat. At €13 per kilo (about $7.25 per pound), this meat was beyond my budget. I bought just enough for a one-person serving. Veal stew for one--meat is braised in wine with red peppers and mushroons. In Spanish, the word “ternera” translates as “veal.” Except it’s hardly ever real veal. Real veal is either designated “lechal,” meaning the meat comes from a very young, milk-fed animal, under six months at slaughter, or “ternera rosada,” pink veal, from an animal under 1 year that has fed on grains. 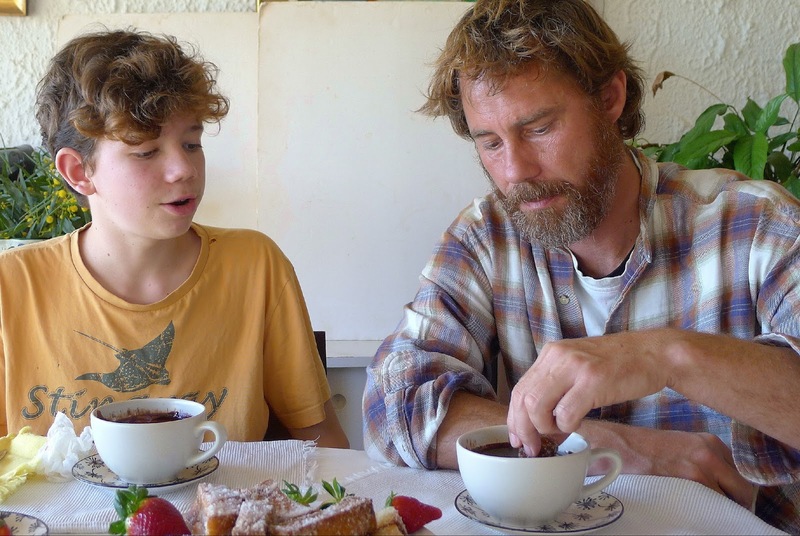 Both are very lean, fairly delicate in flavor compared to meat from an older animal. The problem is that, in a Spanish butcher shop, “ternera” is the word popularly used for “beef.” (The correct designations are “añojo;” yearling, “novillo/a,” “baby beef,” a bull or heifer between 24-48 months, and cebón, steer, up to 48 months. Real beef, buey, or vaca, cow, comes from animals slaughtered at more than 48 months. Veal known as ternera de Ávila comes from animals of the Avileña-Negra Ibérica breed and has protected geographic indication (IGP). Real veal is very lean. This cut needs long braising to be tender. The veal cubes I bought were cut from the aleta, a section of the breast. They were going to need long, slow cooking. I braised them with strips of roasted red peppers and mushrooms in a wine sauce and finished the dish with sliced olives. The meat was fork-tender in about an hour and a half of simmering. But, it was dry. Not really worth the premium price for veal. Next time, I’ll make the same recipe with “beef,” or even with boneless chicken thighs. This recipe for ternera con fritada starts with a sofrito (fritada is a word meaning a sautéed mixture, similar to sofrito) of onions, peppers and mushrooms. 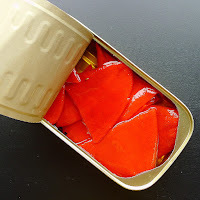 I used two (185-gram) cans of piquillo peppers (about 20 small peppers) for the strips of roasted red peppers. 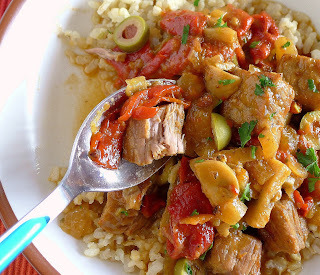 Spanish style, the veal stew would be served with patatas fritas, fries. But I like it better with cooked rice or noodles. 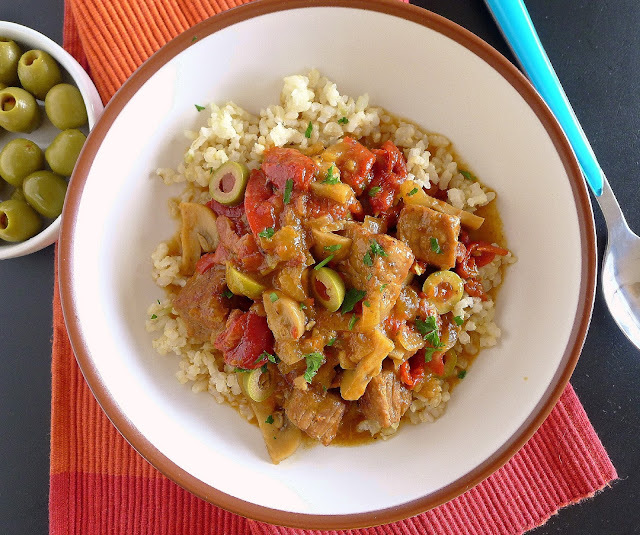 Veal braised in a savory wine sauce is finished with sliced olives. Slow-cooked chunks of veal are tender--but awfully dry. Sprinkle the veal with salt, pepper and thyme. Dust it with flour and pat off excess. Heat 2 tablespoons of the oil on medium heat. Brown the cubes of meat on all sides. Remove with tongs and set aside. Add 2 tablespoons oil to the pan. Add the ham or bacon, onion and garlic. Sauté them for 3 minutes. Add the mushrooms and fry 2 minutes. Add the strips of red peppers and tomato. Cook on medium heat 3 minutes. Add the wine, water and bay leaf. Return the veal to the pan. When the liquid is bubbling, turn down the heat to a simmer and cover the pot. Cook, stirring occasionally, until meat is fork tender, about 1 ½ hours. Stir in the olives and heat. Serve the veal sprinkled with parsley. Where I live in southern Spain, spinach grows through mild winter months and is harvested in early spring. 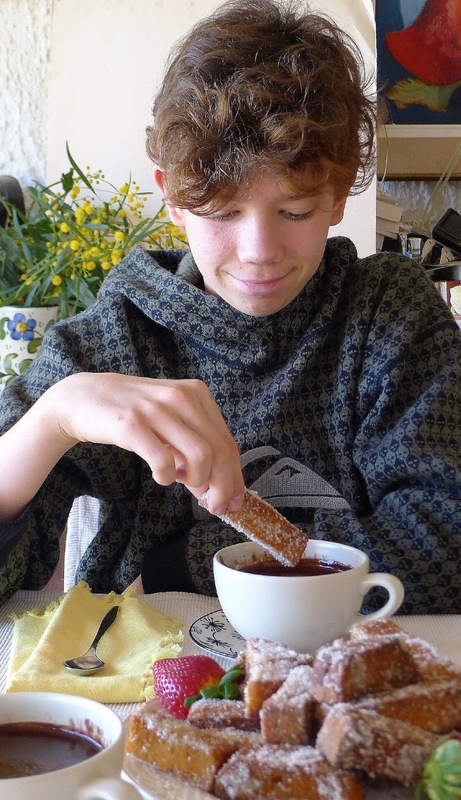 So I’m enjoying it in many different ways (see links to recipes at the end of this post). Today it’s eggs baked in “nests” of spinach. 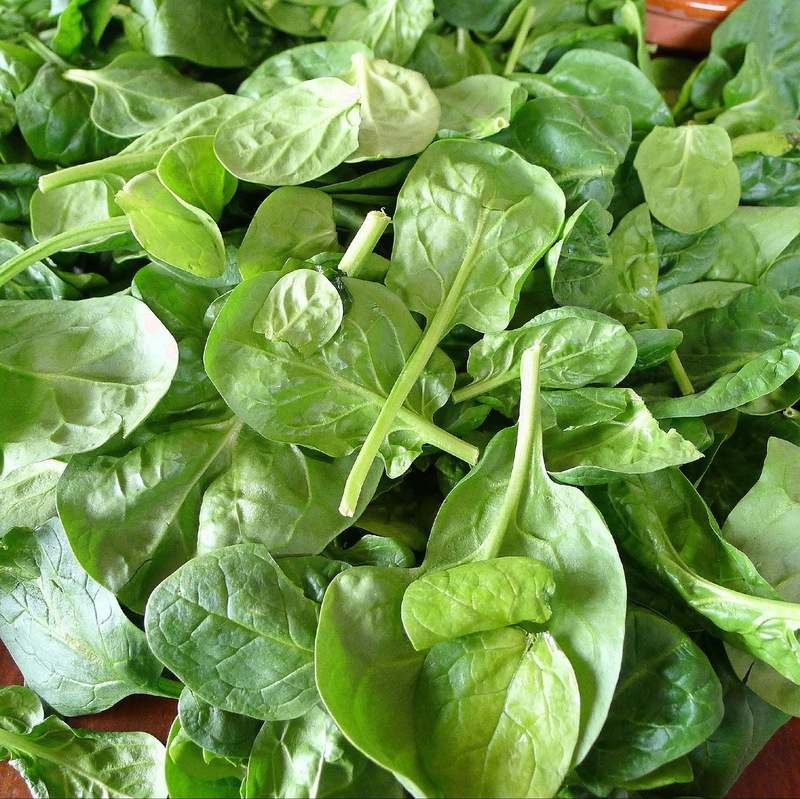 So green and fresh, spinach is a delight in early spring. Spinach is so deceptive. It looks like lots and lots, then cooks down to nothing. Even knowing this, I miscalculated. I figured a pound of spinach leaves—a heap—would be enough for four half-cup servings. It made only enough for three servings. I’ve adjusted the recipe to serve four. 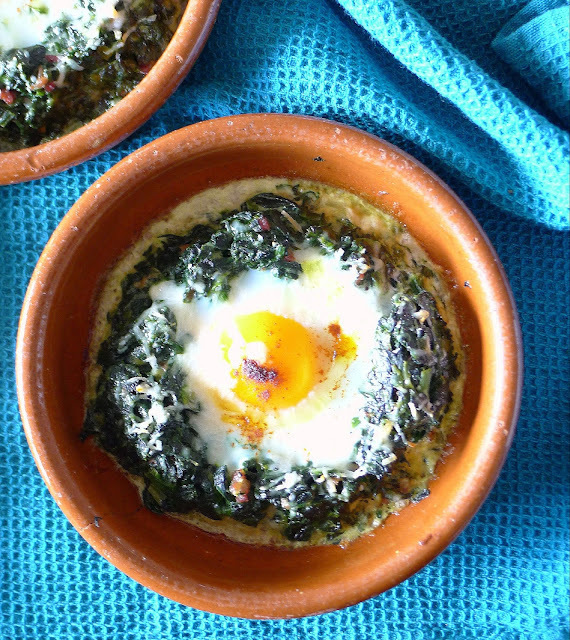 The “nesting eggs” are best prepared in individual ramekins, but they can also be baked in a single oven pan, then scooped out to serve at table. If using earthenware cazuelitas, remember that clay holds the heat, so the eggs will continue to cook after you remove them from the oven. Ready for the oven. Cooked spinach makes a nest. Egg is dropped in the center. Grated cheese on top. The white ramekin is enameled metal; the other two are earthenware. 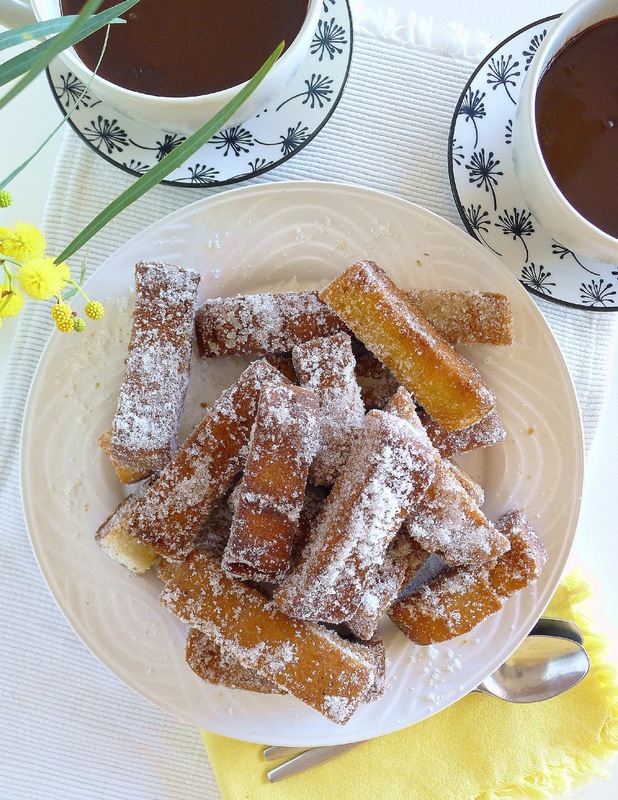 Strips of fried bread are a favorite accompaniment, but toast or fried potatoes are good too. 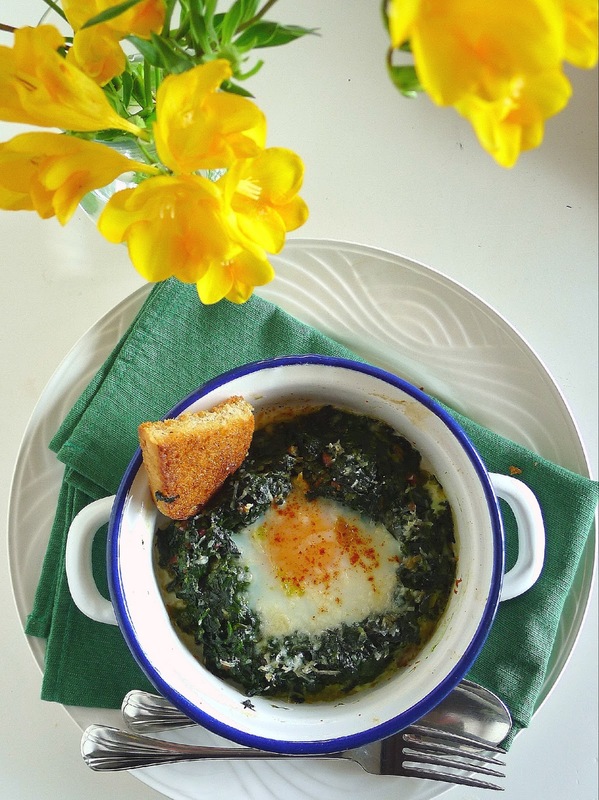 Serve the eggs and spinach for brunch, as a starter for a spring dinner or as a light supper dish. 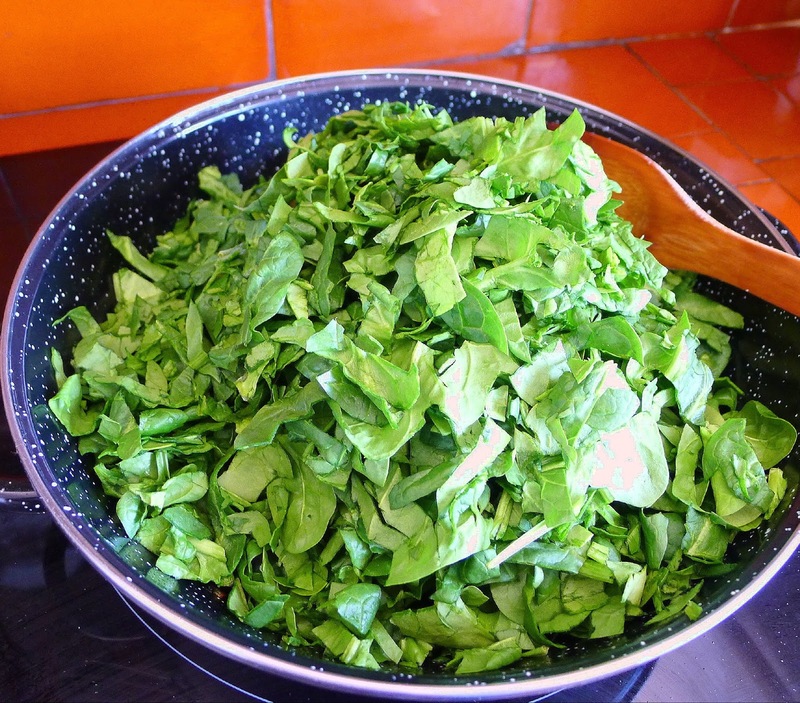 You can use bunches of fresh spinach or bags of washed, ready to use leaves. Spinach you wash will cook with the water clinging to it, but dry, bagged leaves will need a little extra water to cook. 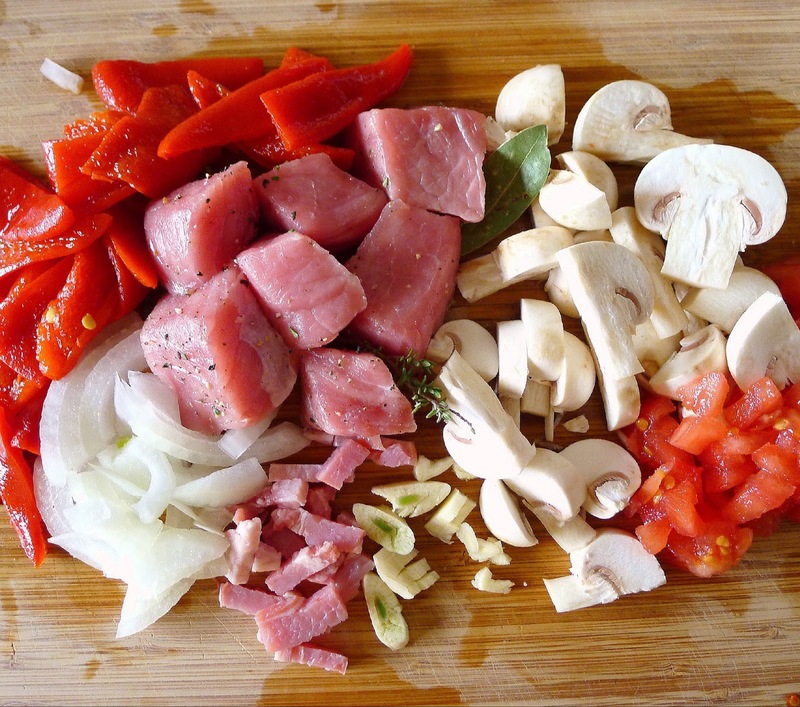 If you choose to use the optional chopped ham, you may not need additional salt. Taste before seasoning. 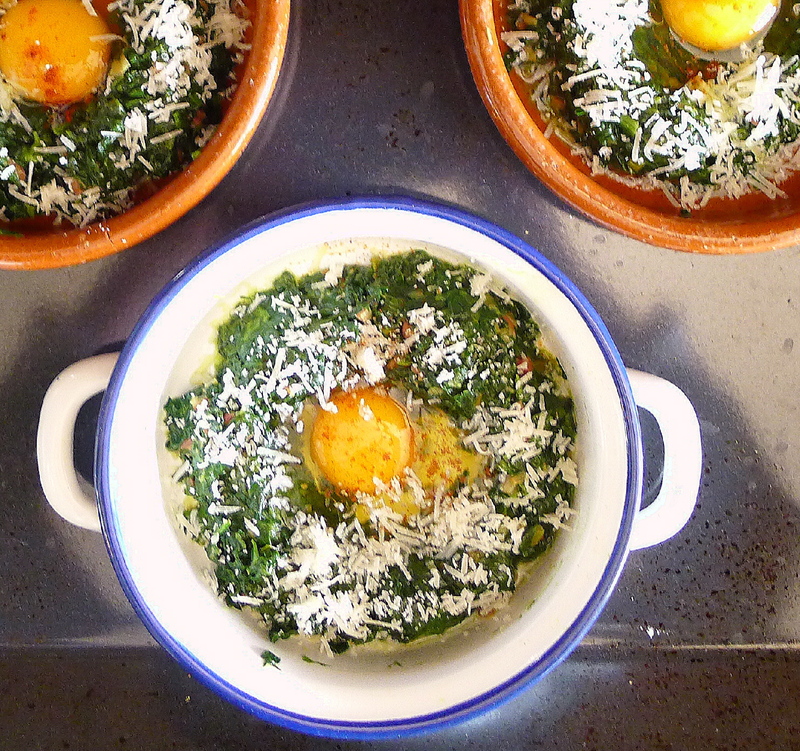 Use regular or smoked pimentón (paprika) for the dash of finishing color on top of the eggs. I like smoked picante—spicy-hot—pimentón on the eggs. Ready to bake. Remember that clay ramekins hold the heat, so the egg will continue to cook after removing it from the oven. After baking, white is set, yolk still runny, cheese is melted. 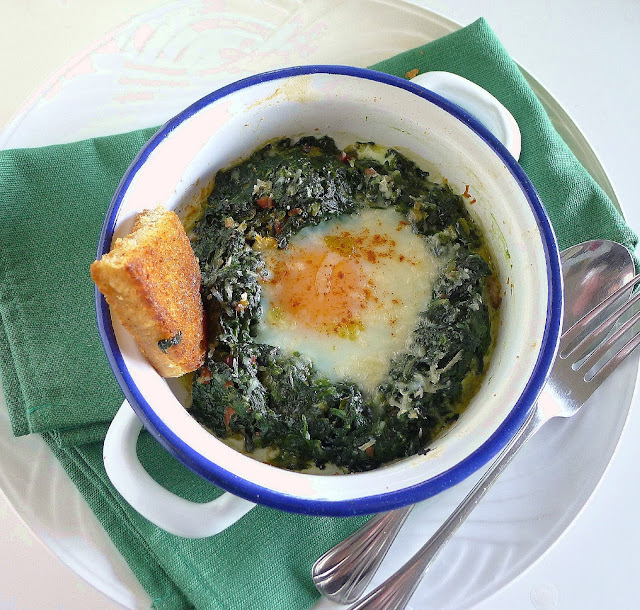 Serve the baked egg and spinach for brunch, as a starter or a light meal. 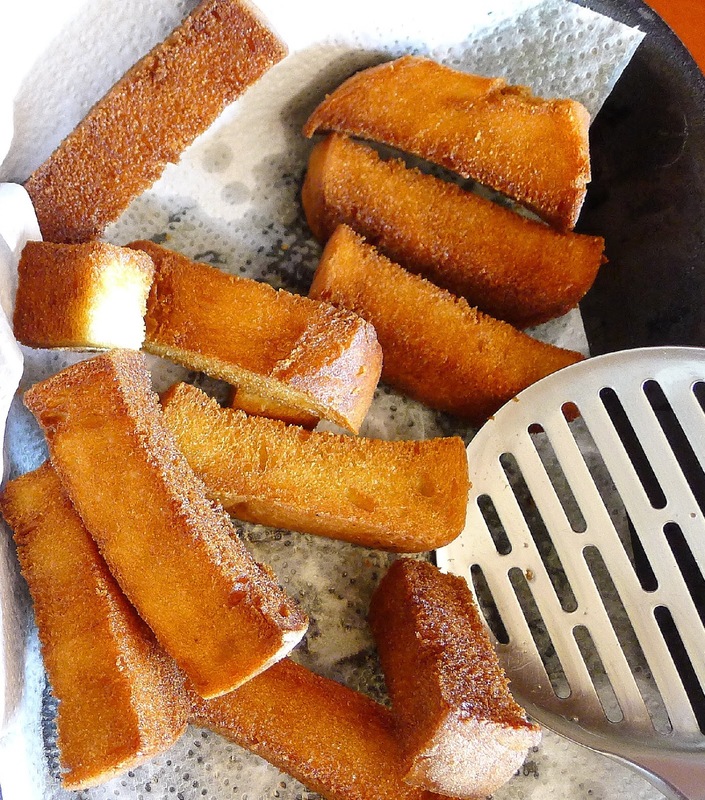 Tirangles of bread fried in olive oil are a good accompaniment. Just right--yolk is still runny. 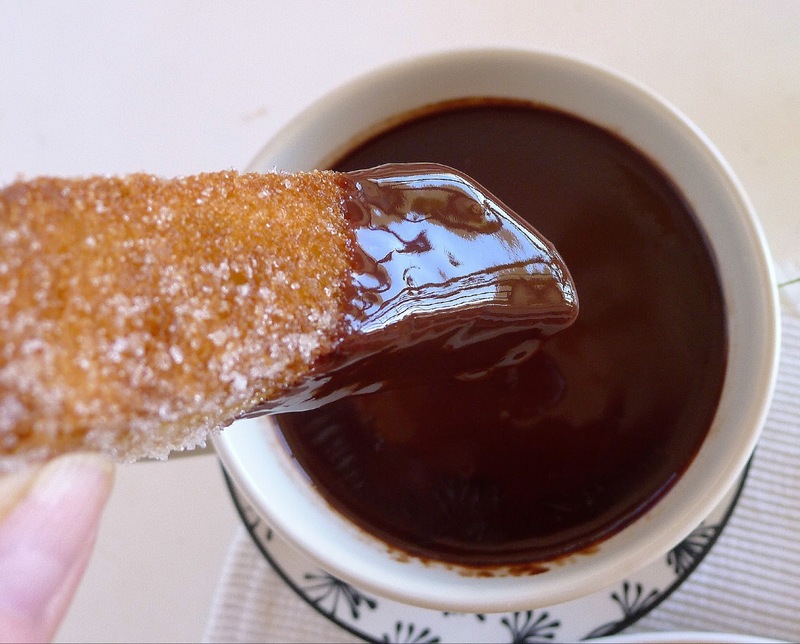 Will you dip the fried bread in the egg? Or mix it all up with the spinach? To chop: roll spinach and slice it. 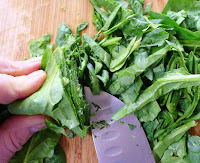 Wash the spinach, if necessary, and trim away stems. Chop or shred the spinach. Heat the oil in a deep pan. Sauté the chopped onion on medium heat until softened, but not browned, 4 minutes. Add the ham, if using, and sautée 1 minute. Add all of the chopped spinach. Stir to mix with the onion. Add a little water, if necessary. Cook the spinach until wilted and tender, about 10 minutes. Season with salt, pepper and nutmeg. If there is liquid remaining in the pan, raise the heat to cook it off. Spinach fills a deep pan, but will cook down a lot. Preheat oven to 400ºF/ 200ºC. Lightly oil 4 oven-safe ramekins or custard cups. Place them on an oven tray. Divide the spinach into four portions. Press each into a lightly oiled cup. Invert it into the ramekin. 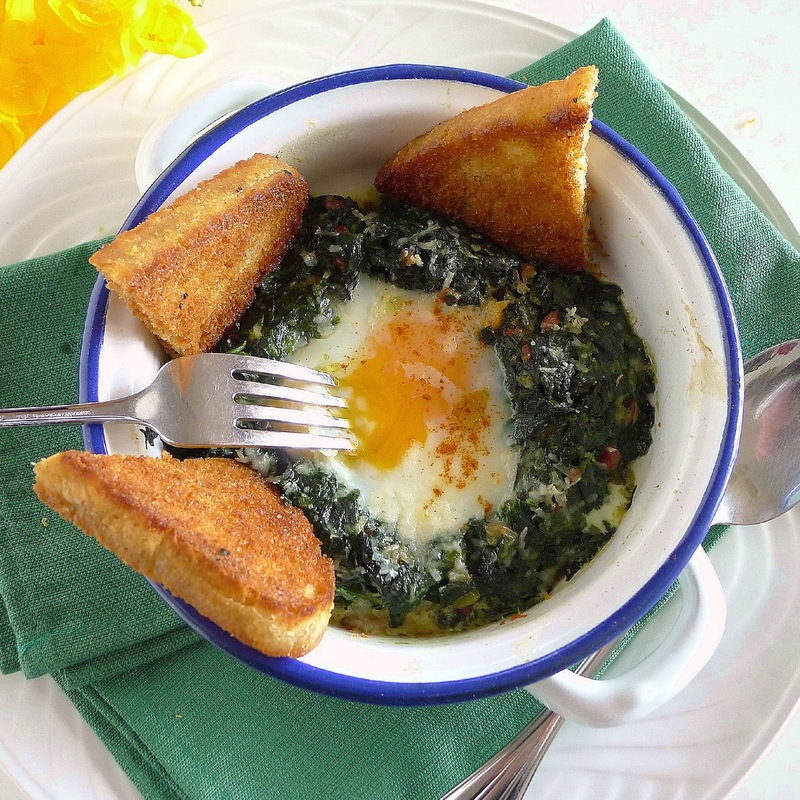 Push open a hole in the center of the mound of spinach, widening it enough to contain a whole egg. Make sure there are no breaks in the rims of the spinach ring, so egg white cannot seep out. 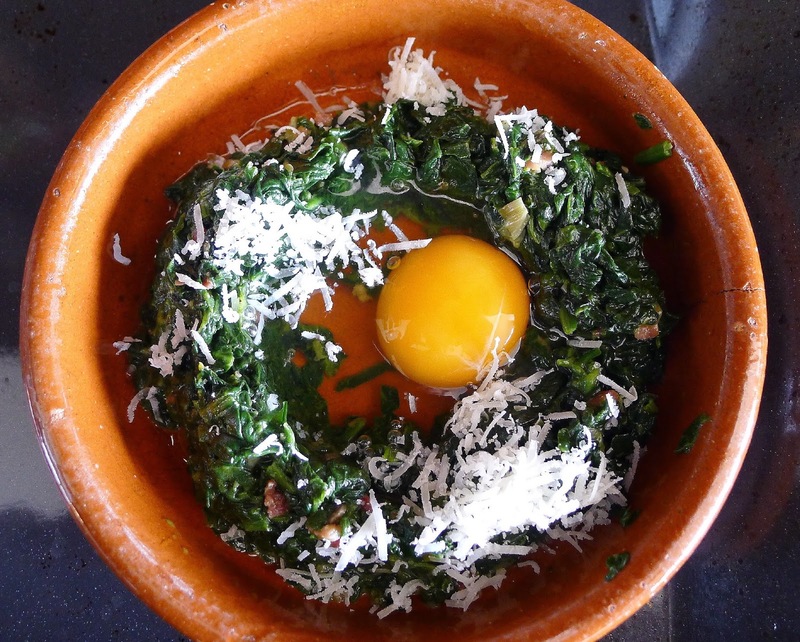 Break an egg into a cup and carefully slip it into the hole in the center of the spinach ring. Drizzle a little olive oil over eggs and spinach. Spread grated cheese on the tops and sprinkle them with pimentón. Bake until the whites are set, but yolks still runny, about 10 minutes. Serve immediately with fried bread. A breath of spring--eggs, spinach and freesias. Spinach with Raisins and Pine Nuts. Chickpeas and Spinach with Cod Dumplings. Turkey Roulade with Spinach Stuffing. Do you ever start out to make one recipe, then change your mind and turn the ingredients into something else altogether? That’s what I did. 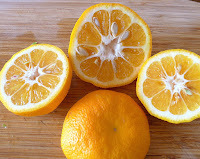 I picked sour oranges from a tree that’s about to be cut back and grafted to produce sweet eating oranges. 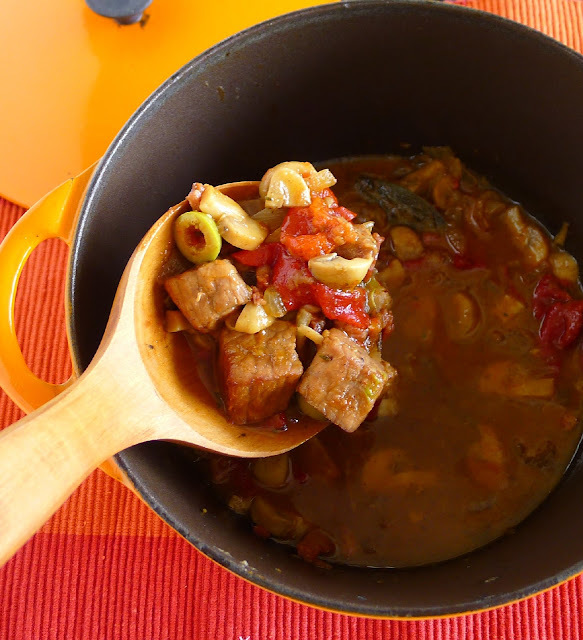 I intended to make a traditional fish soup, called cachorreñas. Bitter orange tree will be grafted to produce sweet oranges. Cachorreña is the local name for the bitter Seville orange, the marmalade orange or bigarade. 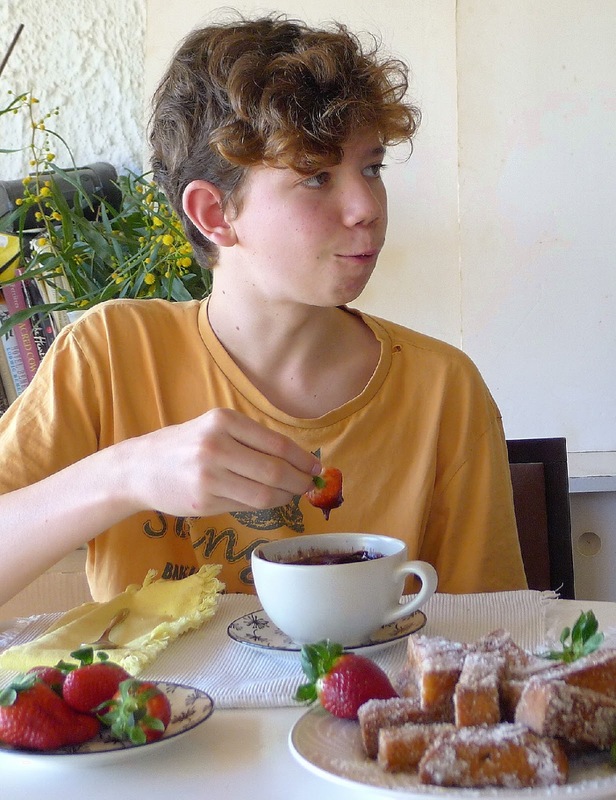 The peel of the fruit is bitingly bitter; the juice is mouth-puckeringly sour. 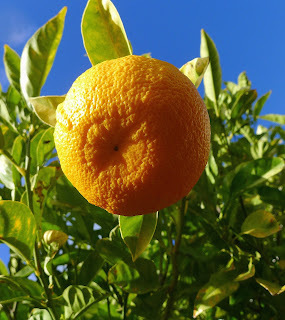 The bitter orange is used as rootstock for growing sweet oranges and is also grown for its decorative beauty and the heady perfume of orange blossoms in springtime. I had gotten as far as making the fish stock for the soup, with head, bones and trimmings from fresh hake, with a strip of orange zest, a whole tomato, green pepper and onion. That’s when it occurred to me to make a thick sauce instead of soup. And, instead of cooking the hake fillets in the soup, maybe bake them? Grill? Batter-fried! Crisp, beer-battered fried fish is served with sour orange sauce and sweet orange salad on the side. In Spain, the bitter oranges are used as an aliño, dressing, for salads. They can be substituted for sweet oranges in remojón, orange and cod salad. The juice is added to marinades and meat stews. 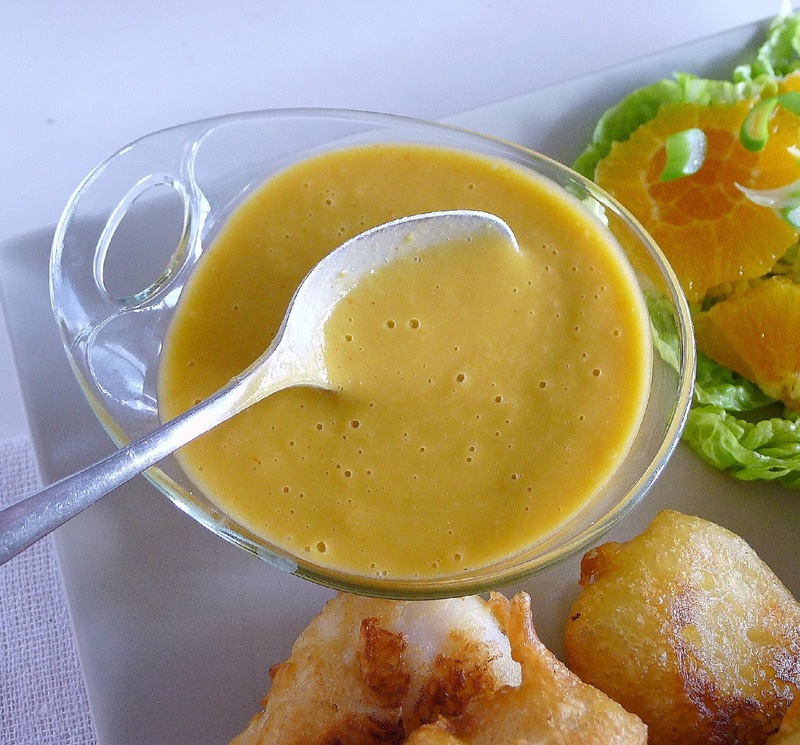 Sopa de cachorreñas is a fish soup with sour orange typical of Málaga. 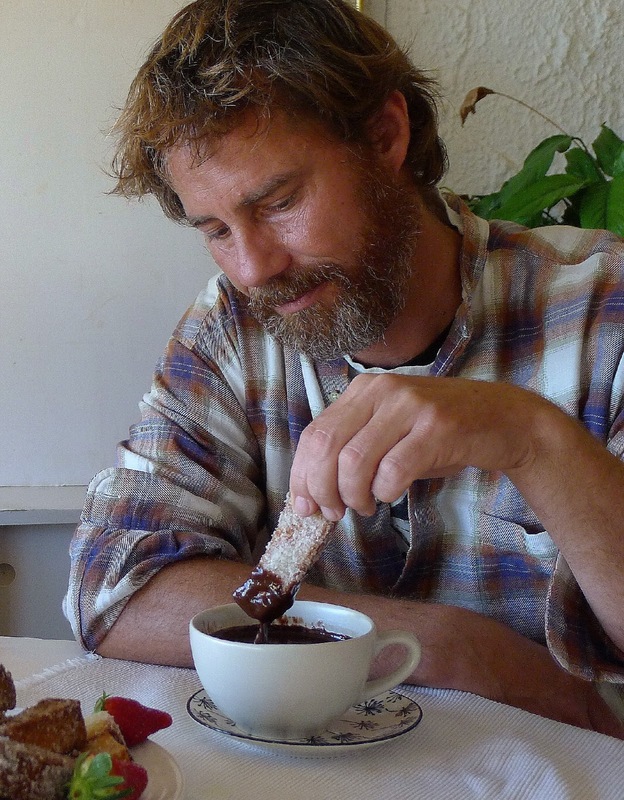 In Cádiz a somewhat similar fishermen’s soup is caldillo de perro, or “dog” soup. 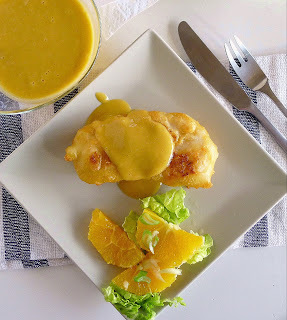 Mayonnaise made with sour orange juice in place of vinegar or lemon is terrific on asparagus or artichokes. The juice is perfect for making Peruvian ceviche, marinated fish. 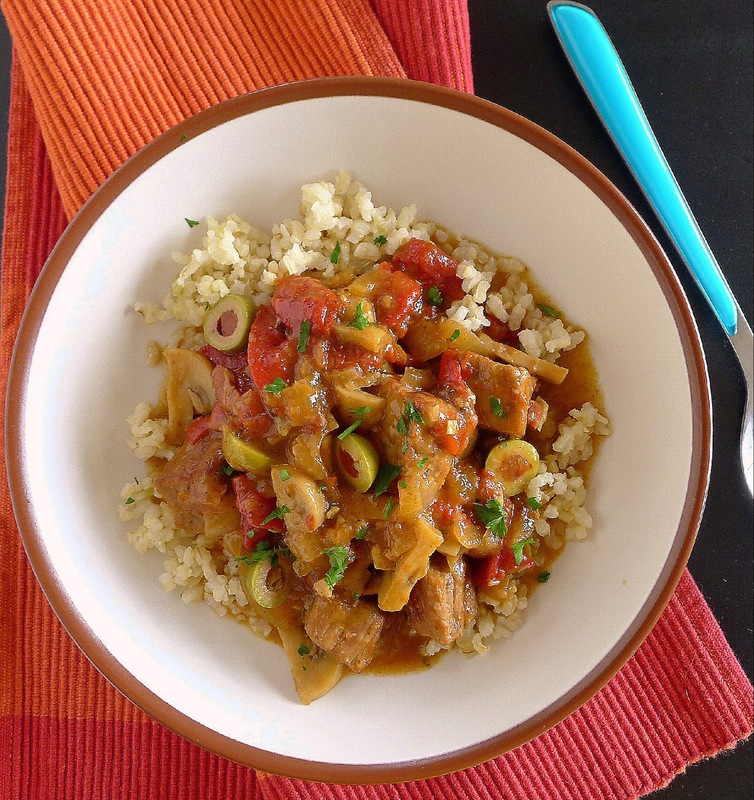 Use it, too, in Persian sweet-sour stews. 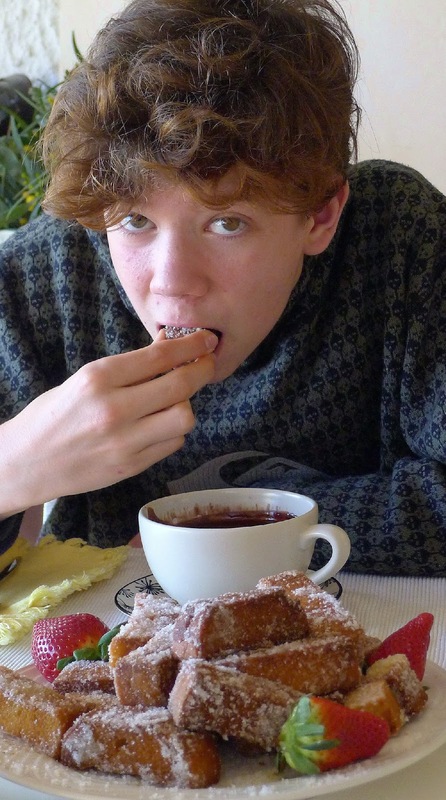 And, there's always marmalade made with whole, shredded bitter oranges that are exceptionally rich in pectin. 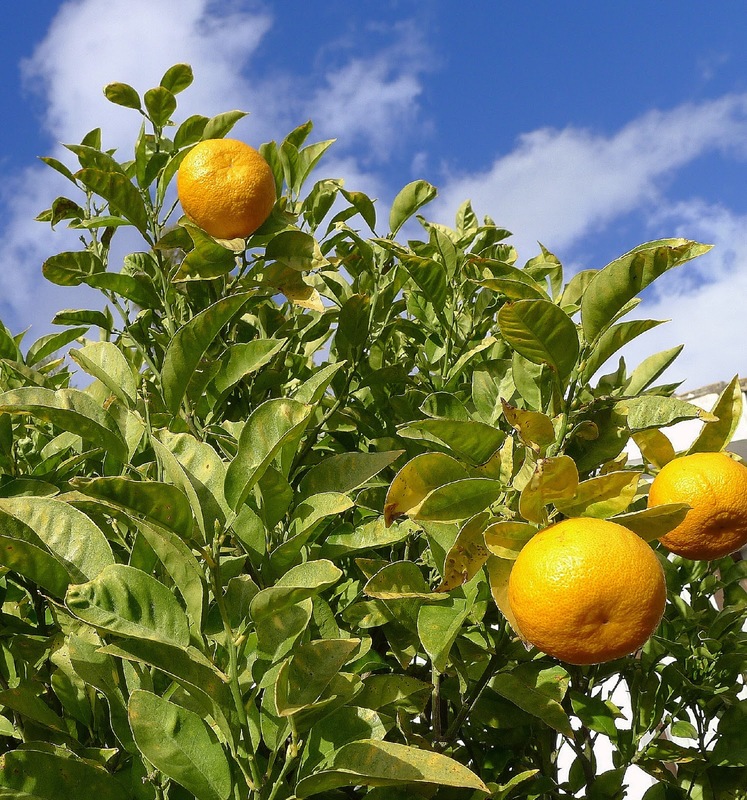 In Spain, bitter orange trees grow in public squares and streets, the fruit free for the picking. Bitter oranges can be found in the US in Latino groceries during winter months. (This is the end of the season.) If not available, I suggest using half white wine vinegar for the sourness, and half sweet orange juice. Sour orange juice makes a tangy sauce to serve with fish, shrimp or vegetables such as asparagus. This makes a pouring sauce that can be served room temperature. 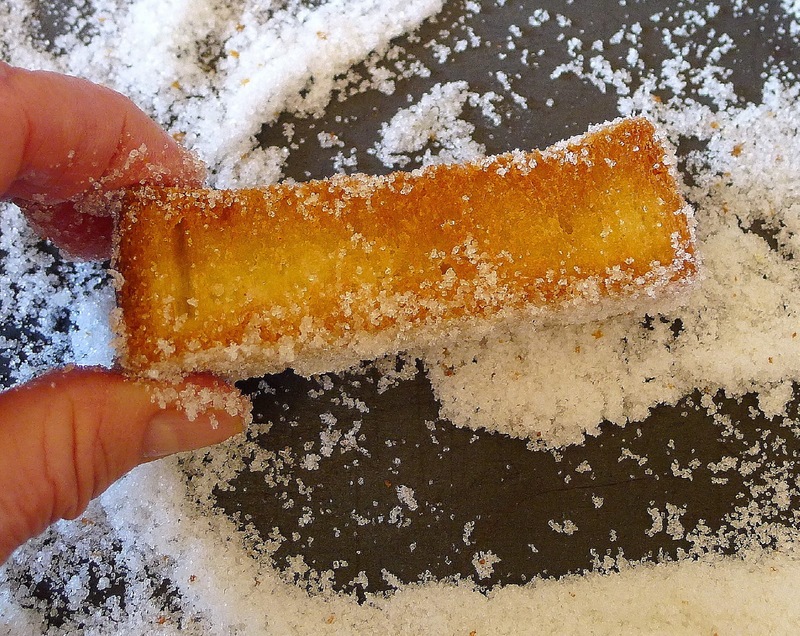 For a thicker, dipping sauce, double the quantity of bread (thickener) and add more salt to season. The sauce is also good with a couple spoonfuls of mayonnaise beaten into it. Try it with shrimp. Place the whole tomato, pepper, onion, parsley and bay leaf in a pan and cover with water or fish stock. Add 1 teaspoon salt. Bring to a boil and cook until the vegetables are very soft, about 15 minutes. Skim out the tomato, pepper and onion and discard the water, parsley and bay. Place the bread crumbs in a blender. Add the pimentón. Slip the skins off the tomato and pepper and add them to the blender with the onion, garlic and sour orange juice. Blend until smooth. Gradually blend in the oil. Season the sauce with ½ teaspoon salt and a dash of hot pepper sauce. Stir in the chopped scallions. Serve the sauce at room temperature. 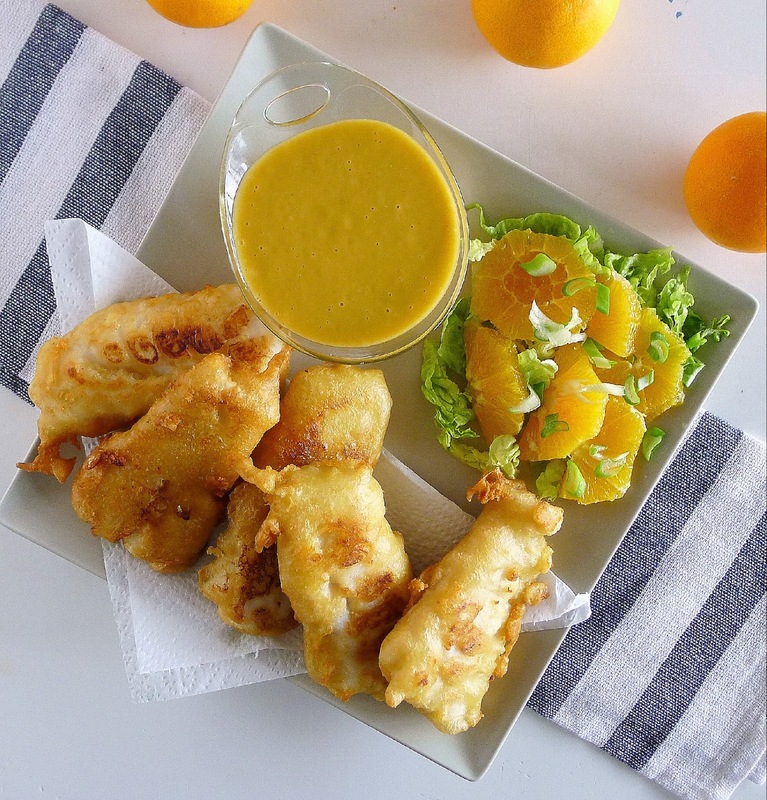 Batter-fried fish is crisp on the outside, moist on the inside. Use a white fish such as hake, cod, grouper or halibut. Cut the fish in 8 equal-sized pieces and place them on a plate in one layer. Sprinkle them with salt and pepper. Place 2 tablespoons of the flour in a small bowl. 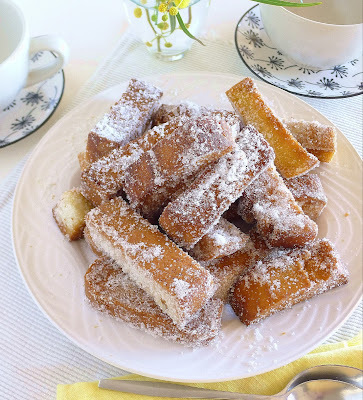 Combine the remaining flour in a bowl with the salt and baking powder. Beat in the beer to make a fairly smooth batter about the consistency of thick cream. Let the batter set 30 minutes. Pat the pieces of fish with paper towels to absorb excess moisture. Sprinkle the reserved 2 tablespoons of flour on both sides of the fish. Place oil to a depth of 2 inches in a wide, heavy pan. Heat the oil until it is shimmering (360ºF/ 180ºC). 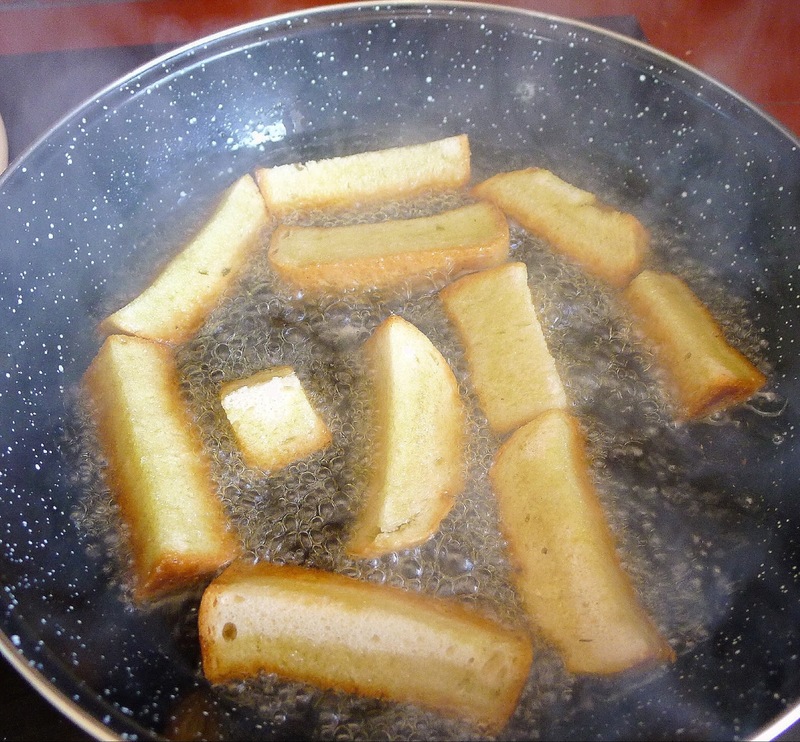 A drop of the batter should immediately sizzle and rise to the top of the oil. 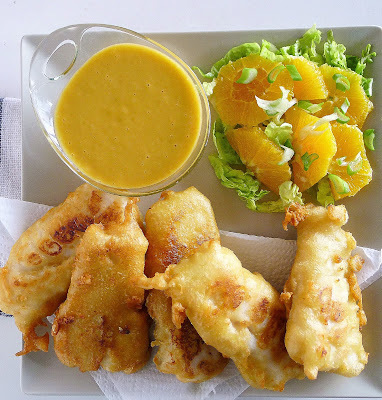 Dip the pieces of fish in the batter, letting excess run off. Place them, a few at a time, in the hot oil. Fry until golden on one side. Carefully turn the fish and fry until golden on reverse side (about 5 minutes total). Remove with a skimmer and place on paper towels to absorb excess oil. The fish stock I made with orange peel is in the freezer, ready to make the sour orange fish soup on another day. Perhaps we should leave one branch of the tree ungrafted. I like having a few sour oranges every year.